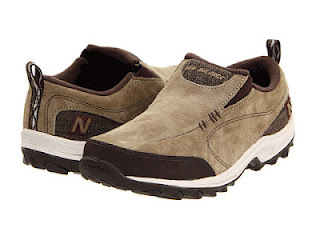 This is a great shoe for the man in your life who needs a comfortable slip-on shoe! I have many patients who have trouble reaching their feet because of hip and knee replacements, severe arthritis, back pain or because they are elderly. If you get a long-handled shoe horn, these are great shoes that are easy to get on. ends up getting less biomechanical control of the foot, which is counterproductive because it causes more strain to their knees, hips and lower back. A shoe with no rearfoot control forces the person wearing them to put more mechanical strain on their joints, muscles, and tendons to hold the shoe on their foot. In other words, this shoe is far more comfortable than a slip-on shoe with no back to it. The WWM756 offers a thick rigid sole, which is protective of the foot. It also has a wide soft toebox, which is great for patients who need more room to accommodate their hammertoes and bunions. The insert inside the shoe can be replaced by a custom-molded insert or over-the-counter insert that offers more arch support for better biomechanical control. And it’s a nice looking shoe!